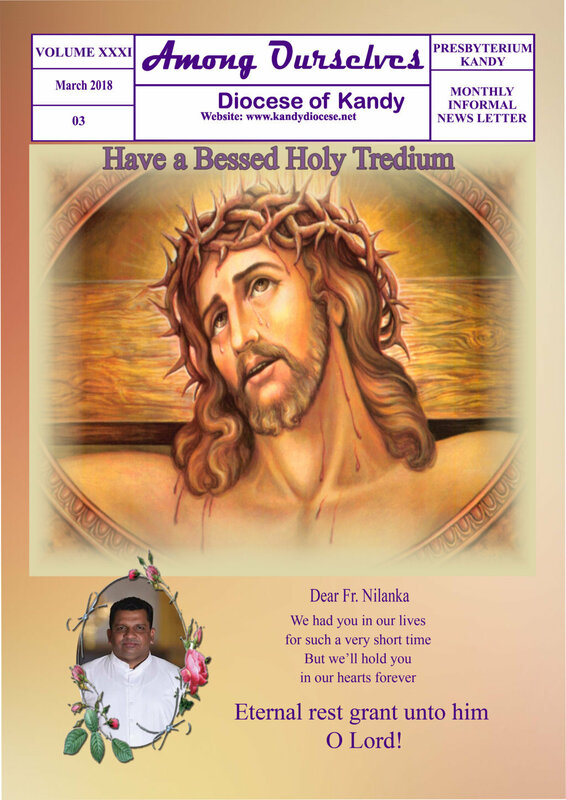 My dear Fathers, We are still recovering from the shock and grief of the untimely and sudden demise of our brother in the Presbyterium, Fr.Nilanka Dias. Time and again I have been repeatedly reminding all of you of the importance of the regular health check up. Today all facilities are available to ensure that no one needs to face unexpected health issues as medical specialists are easily available and are able to diagnose not only life threatening illnesses but even the proneness to such illnesses. Through simple tests they can be diagnosed and treated. We owe it to the Lord and our faithful to look after our health as the life of a priest is so precious. The spontaneous and profuse grief of the people, of Nanuoya and other parishes, where Fr. Nilanka had served, was an ample demonstration of how much he was loved and appreciated by the faithful whom he served with such dedication and commitment. His gentle ways and missionary zeal endeared him to the poor people in the parishes where he served. May the Lord grant him the reward of His faithful servants. We offer our heartfelt sympathies to Fr. Nilanka’s beloved parents and his only sister and her husband and children. As you know for our faithful specially in up country the “fortieth day” after the death marks the closing of the mourning period. 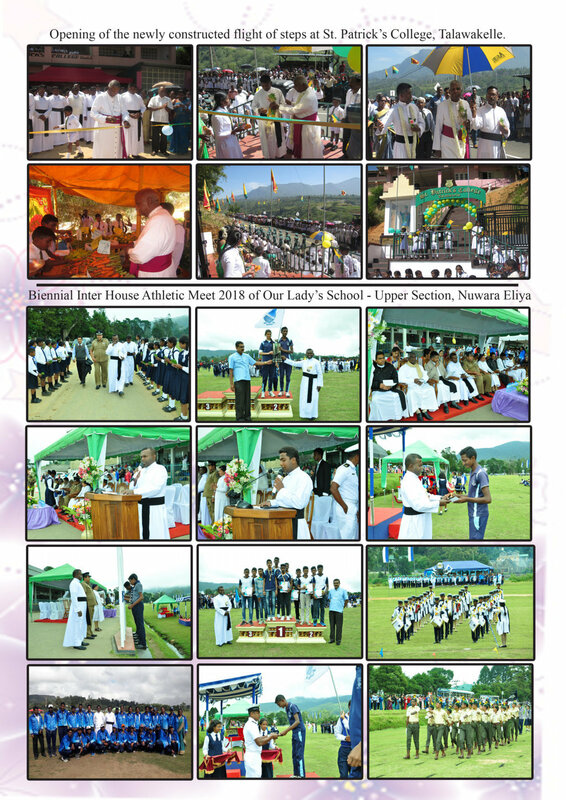 A Memorial Holy Mass is being organized by the parish of Nanuoya on the 12th of March at 4 p.m. at St.Rita’s Church, Nanuoya.I will celebrate the memorial Mass and I invite all of you specially the priests of the Nuwara Eliya vicariate to concelebrate with me as it would be a great consolation for the parents and sister of Fr. Nilanka and the parishioners of Nanuoya. The participation and enthusiasm of the members, of the Diocesan Pastoral Council, held on the 17th February was very encouraging as regards the implementation of the objectives of the theme for the year 2018,namely the “The year of deepening the faith of our people in view of becoming a missionary Church in the model of St.Joseph Vaz”.Please ensure that you make your detailed pastoral plan for the year with a time frame ,with the active participation of your parish pastoral councils and other Religious and lay representatives of every parish. At our Monthly Presbyteral meetings we shall listen to the parish plans and how they are being carried out. As usual, our Chrism Mass, with the renewal of our Priestly commitment, will take place on the 26th March (Monday of Holy Week) at our Cathedral. All priests, Diocesan and Religious, are expected to participate in this Holy Mass to renew their priestly commitment. I, also, wish to remind all of you to organize ,with your brother-priests in the neighboring parishes, Institutions and Religious houses, Penitential celebrations, with sufficient priests for hearing Confessions, to enable our faithful to, meaningfully, receive the Sacrament of Reconciliation during Lent. Q: Why are Palm Sunday and Passion Sunday celebrated on the same day? Before the Second Vatican Council, Passion Sunday was used to denote the Fifth Sunday of Lent in the liturgical calendar, which was then the start of a two-week sub-season called “Passiontide”. It used to be called the First Sunday of Passiontide, with the Second Sunday being Palm Sunday. “Passiontide” was suppressed in the 1969 liturgical calendar revision, which went into effect in 1970. Palm / Passion Sunday has two focal points. The first is the entrance of Jesus into Jerusalem just days before his arrest, trial and crucifixion. The second is the reading of the Passion Gospel. Q: What is Palm Sunday all about? The liturgy for this day begins with an enactment of Jesus’ entry into Jerusalem, with palm branches waved by worshippers. Originally, the procession was separate from Mass, but was eventually attached to the beginning of the Eucharistic celebration. All four Gospels state that Jesus rode a colt into Jerusalem, where the people laid down their cloaks, along with small branches of trees, in front of him. Only John’s Gospel mentions palm leaves. The people are also described as singing part of Psalm 118 – “Blessed is he who comes in the name of the Lord”, which is part of the processional hymn for the Jewish feast of Tabernacles. Q: Why do we wave palms? As a symbol of triumph, the palms point us towards Christ’s resurrection and remind us of the saints in heaven “wearing white robes and holding palm branches in their hands” (Rev 7:9). The white robes remind us of baptismal garments, and the palms suggest their triumph over sin and death through the waters of baptism. In Jewish tradition, the palm branch is a symbol of triumph and victory. Hence, the scene of the crowd greeting Jesus by waving palms and carpeting his path with them has given the Christian celebration its name. Carrying palms in procession goes all the way back to the Old Testament (Lev 23:40). Q: What happens to the leftover palms from Palm Sunday? They are saved and burned to make the ashes for the next Ash Wednesday. The palms, which symbolize triumph, and the ashes, which symbolize death and penitence, form a great symbolic connection between suffering and victory. Q: What is Passion Sunday? The second part of the Mass focuses on the Cross and Passion of Christ. Passion Sunday memorializes the increasing hatred against Christ from those who would not accept him. Q: Why is Holy Thursday also called Maundy Thursday? The word “Maundy” is derived from the first word of the Latin phrase, “Mandatum novum do vobis ut diligatis invicem sicut dilexi vos” (A new commandment I give unto you, that you love one another as I have loved you). Jesus exemplified the significance of this teaching to his disciples by his action of washing their feet. Q: What is “the washing of feet”? A priest or bishop (representing Christ) ceremonially washes the feet of typically 12 persons chosen as a cross-section of the community. They will be seated before the congregation. The priest goes to each, pours water over each one’s feet and dries them. The rite usually takes place after the Gospel reading of how Christ washed the feet of his 12 Apostles and it highlights the importance of humility and service. “Washing of feet” appears to be part of the hospitality customs of Jesus’ time. Typically, the host would provide water for guests to wash their feet, or ask a servant to wash the feet of the guests. This is mentioned in several places in the Old Testament of the Bible (e.g. Gen 18:4; 19:2; 24:32; 43:24; 1 Sam 25:41), as well as in other religious and historical documents. 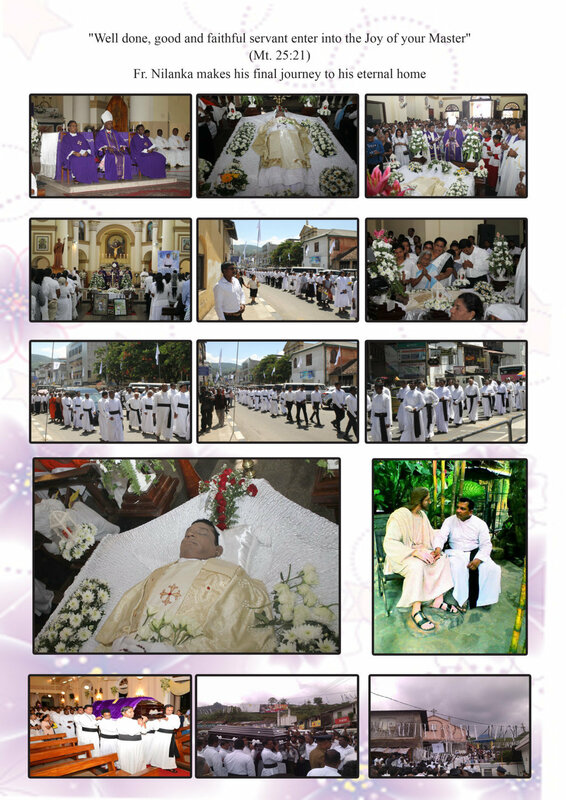 Q: What is the Altar of Repose and what is it used for? The Altar of Repose is an altar where the Communion Host, consecrated at Mass on Holy Thursday, is reserved until the following day, Good Friday. At Mass on Holy Thursday, two hosts are consecrated; after the consumption of the first, the second is placed in a chalice, which is covered with a pall and inverted paten; over these is placed a white veil, tied with a ribbon. This remains on the corporal in the centre of the altar till the end of Mass, when it is carried in solemn procession to the Altar of Repose. This host is reserved for Good Friday service, when there is no Mass. The Holy Thursday service concludes with the stripping of all altars except the Altar of Repose. Q: Why is the main altar stripped? Since the altar symbolizes Christ, the “stripping of the altar” symbolizes the abandonment of Jesus by his disciples and the stripping of Jesus by the soldiers prior to his crucifixion. This represents the humiliation of Jesus and the consequences of sin as a preparation for the celebration of new life and hope that is to come on Easter. Q: Do we genuflect on Holy Thursday or bow? Catholics genuflect on one knee to the tabernacle where consecrated hosts are kept each time they are in church. The same is done on Holy Thursday until the consecrated hosts are removed from the tabernacle and kept in the Altar of Repose. After that, there should be no genuflection to the tabernacle as Christ is not there anymore. Since Catholic piety has made Holy Thursday a day of exceptional devotion to the Blessed Sacrament, the faithful can bow or kneel on both knees at the Altar of Repose and to adore the Blessed Sacrament too. Good Friday Q: Why is Good Friday called ‘Good’ if Jesus died on this day? The church uses the word “Good” to show that Christ has died to liberate everyone from sin, and that suffering and death are not pointless. It is also called “Good” because it shows forth the absolute goodness of God on our behalf. Q: Why do we venerate the cross? In the seventh century, the church in Rome adopted the practice of the adoration of the cross from the church in Jerusalem, where a fragment of wood believed from the Lord’s cross had been venerated every year on Good Friday since the fourth century. According to tradition, a part of the Holy Cross was discovered by St. Helen, mother of the emperor Constantine, on a pilgrimage to Jerusalem in 326. A fifth century account describes this service in Jerusalem: A coffer of gold-plated silver containing the word of the cross was brought forward. The bishop placed the relic on a table in the chapel of the crucifixion and the faithful approached it, touching brow and eyes and lips to the wood as the priest said (as every priest has done ever since): “Behold, the wood of the cross.” Veneration of an image or representation of Christ’s cross does not mean that we actually adore the material image, of course, but rather what it represents. In kneeling before the crucifix and kissing it, we are paying the highest honour to the Lord’s cross as the instrument of our salvation. Because the cross is inseparable from his sacrifice, in reverencing his cross we, in effect, adore Christ. Thus we affirm: “We adore thee, O Christ, and we bless you because by your Holy Cross, you have redeemed the world.” Q: Why is the lamp beside the tabernacle unlit on Good Friday? This sanctuary lamp (or altar lamp) that continually burns before the tabernacle is kept alight to indicate and honour the presence of Christ. On Good Friday the tabernacle is empty, hence an unlit lamp indicates that Christ is not present in the tabernacle. This symbolizes the darkness of sin. Q: What is the Easter Vigil? The Easter Vigil celebrates the resurrection of Christ Traditionally, the Easter Vigil is held between sunset on Holy Saturday and sunrise on Easter Sunday. It is considered the first celebration of Easter Day. Historically, it is at this vigil where adult catechumens are initiated into full communion with the church. Q: What is the significance of the Easter Vigil? The Catholic Church considers the Easter Vigil the most important Mass of the liturgical year. At this Mass, the word “Alleluia” is first used to rejoice since Lent started. Q: What takes place at the Easter Vigil? There are four main parts in the celebration – the Service of Light, the Liturgy of the Word, Christian Initiation and the Renewal of Baptismal Vows and the Holy Eucharist. Q: What is the Service of the Light? The Service of the Light marks the beginning of the celebration of Easter Vigil. Where possible, the faithful gather outside the church after sunset where a fire is blessed by the celebrant. ThisAll baptized Catholics (those who have received the “Light of Christ”) present then receive the fire lit from the paschal candle. This symbolic “Light of Christ” spreads through the congregation as one candle after another is lit. Once the candle has been placed on its stand in the sanctuary, the lights in the church are switched on and the assembly extinguish their candles for Mass to begin. Q: What is uniquely symbolic about the paschal candle? The paschal candle displays the Greek letters alpha and omega (the beginning and the end), and the year at its base. There are also five grains of incense embedded into it to represent the five wounds of Jesus Christ (the nails in each hand and foot, as well as the spear in the side). Q: How is the Liturgy of the Word at Easter Vigil different from ordinary Mass? The Liturgy of the Word at Easter Vigil consists of seven readings from the Old Testament and two from the New Testament. The account of the Israelites’ crossing of the Sea of Reeds is given particular attention in the readings since this event is at the centre of the Jewish Passover, which Christians believe Christ’s death and resurrection is the fulfilment of. Each reading is followed by a psalm and a prayer relating what has been read in the Old Testament to the Mystery of Christ. After these readings conclude, the Easter Vigil proper is finished and the Mass of the Resurrection begins. Q: Why are converts baptized at the Easter Vigil? As Easter Vigil celebrates Christ’s resurrection from death to life and bringing light into the world, the converts are the new life that God has brought through Jesus’ death and resurrection to individual believers. This important emphasis on the continuity of the church with the Old Testament readings at the Liturgy of the Word bear witness to God’s ongoing work in history to define the nature of the church and its mission in the world. Q: What is the significance of the converts being clothed in white garments? The clothing of the white garment symbolizes the convert’s new life in Christ. (It is also the origin of the tradition of buying new clothes at Easter. • Make sure it is God’s trumpet you are blowing- if it is only yours it won’t wake the dead, it will simply disturb the neighbours . • It is not too much to say that the preacher who loves to be before the public is hardly prepared spiritually to be before them. • Popularity has killed more prophets than persecution. • If you want to warm a church, put a stove in the pulpit. • The church is looking for better methods; God is looking for better men. • When you shoot over their heads, all you prove is that you are a poor aim. • If a preacher can interest a child with his sermon, he can interest an apostle. • A preacher may lose God in his sermon. • One day of preaching (Day of Pentecost) was preceded by ten days of praying. Our pattern is oftentimes- one day of praying precedes ten days of preaching. • Before you speak about God, you must speak to God. • My test of the worth of a preacher is when his congregation go away saying, not, what a lovely sermon, but, I will do something. • I should rejoice to hear any one of my congregation saying, ‘I forgot who preached, I felt so much the influence of the truths he preached. • Preach not because you have to say something, but because you have something to say”. • Put more fire into your sermons or put more sermons into the fire. • God’s grace can do anything without ministers’ preaching; but ministers’ preaching can do nothing without God’s grace. • A preacher should know four things- his time, his Bible, his God and himself. Instead of gulping your food, try eating more slowly. It may help you drop those unwanted pounds, a new study by Japanese researchers suggests, and it also helpful avoiding snacks after-dinner and eating anything in the two hours before you go to bed, the researchers said. The study linked those simple changes to a smaller waist, and lower rates of obesity and overweight. Compared with people who gobbled their food, those who ate at a normal speed were 29 percent less likely to be obese. But those who ate slowly were up to 42 percent less likely to be obese. In addition, slow eaters tended to be healthier and to have a healthier lifestyle than those who ate quickly or at a normal speed. They were led by Dr. Haruhisa Fukuda from the Department of Health Care Administration and Management at Kyushu University Graduate School of Medical Sciences in Fukuoka, Japan. Snacking after dinner and eating within two hours of going to sleep also were linked to changes in weight. Skipping breakfast was not. Previous research has linked eating quickly to impaired glucose tolerance and insulin resistance. The study suggested that this might be because fast eaters consume more food before feeling full. Slow eaters, however, become aware of feeling full before they’ve consumed too much. “Slow eating has its pros and a few cons,” said Samantha Heller, a senior clinical nutritionist at New York University Medical Center in New York City. On the one hand, slow eating gives our bodies time to register a sense of satisfaction and fullness, so we tend to eat less, she said. We, 45 participants from Bangladesh, France, Hong Kong, India, Indonesia, Japan, Malaysia, Myanmar, Nepal, Pakistan, the Philippines, South Korea, Sri Lanka, Taiwan and Thailand, gathered in the Baan Phu Waan Pastoral Training Center (Bangkok, Thailand) from 8 to 13 January 2018 to reflect on the global social economy and the impact of climate change on the family in the light of Amoris Laetitia. 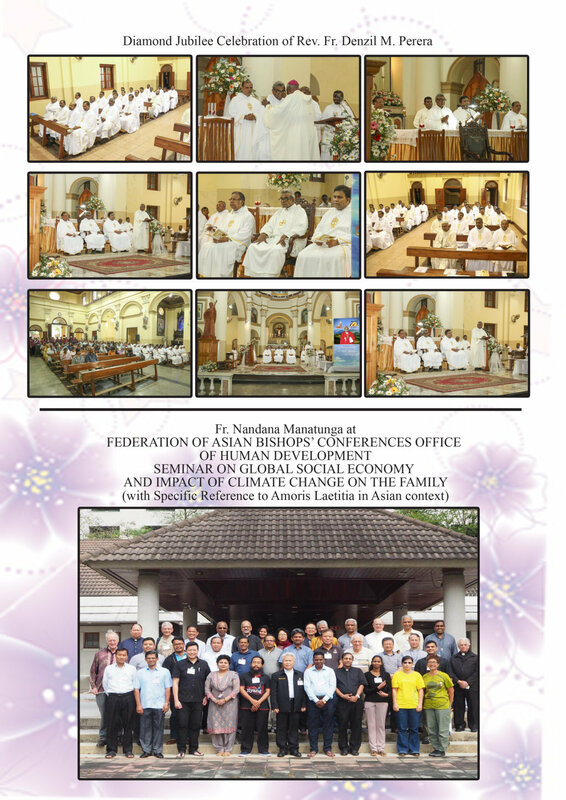 This seminar was organized by the Office on Human Development of the Federation of Asian Bishops’ Conferences in collaboration with the Catholic Commission for Justice and Peace of the Catholic Bishops’ Conference of Thailand and the Asia-Pacific Justice and Peace Workers Network. Coming from diverse cultures and working in various capacities in justice and peace, family and life, human development, we salute the People of God in Asia and, with the Holy Father, Pope Francis, we “thank God that many families, which are far from considering themselves perfect, live in love, fulfill their calling and keep moving forward, even if they fall many times along the way” (Amoris Laetitia 57). [ Seeing ] We began by visiting communities in Sampran (Thailand) already living out creative solutions to injustice, inequality and lack of harmony: producers’ cooperatives, organic farming and religiously motivated communities. We see them as examples of sustainable development and ecologically responsible communities that live out the principles of solidarity, subsidiarity, participatory democracy. They show us that the transformation of the liquid or market economy to a social economy is possible, as envisioned by Pope Francis. [ Judging ] Now the company of those who believed were of one heart and soul, and no one said that any of the things which he possessed was his own, but they had everything in common. And with great power the apostles gave their testimony to the resurrection of the Lord Jesus, and great grace was upon them all. There was not a needy person among them, for as many as were possessors of lands or houses sold them, and brought the proceeds of what was sold and laid it at the apostles’ feet; and distribution was made to each as any had need (Acts: 4:32-35). 1. To celebrate, develop and promote the Asianness of our families: “We observe the close inter-generational family kinship in Asian families. This is palpably true for the nuclear Asian family of parents and children but also includes the extended family of cousins, nephews, nieces, grandparents and grandchildren. We see the great respect and honor, nay, affection that families give the elderly. Asian families typically love children and have the great desire to have children, for children are God’s gifts and blessings. We ourselves testify to a culture of caring for family members who are physically or mentally disadvantaged, the welcoming hospitality of Asian families despite their poverty, their support of one another in times of need, of grief, of disaster. For Catholic families, parents and children are participating together more frequently in the celebration of Holy Mass and praying more together” (FABC XI, n. 6; in harmony with AL 197). 2.To continue fostering a culture of hope, solidarity and care – especially among the young – that welcomes the advances in technology and the human sciences, and uses them to serve the Asian family, to promote harmony, and to care for the Earth. 3. To support the establishment of cooperatives, mutual aid societies and similar incarnations of the social economy. To hold joint regional and national consultations and workshops that would study the obstacles and opportunities offered by current national laws and local customs as well as the historical and cultural context of evangelization in order to arrive at relevant approaches and realistic strategies. To conduct follow-up workshops and monitor the implementation of the resolutions and recommendations. Increase the opportunities for the participation of women and consecrated persons, and for sharing among the participants. To support the establishment of cooperatives, mutual aid societies and similar forms of the social economy. d. To promote the spiritual formation of the youth and their active participation in civil society in favor of the common good, the upliftment of the poor and the transformation of social structures. [ Gratitude ] From the depths of our hearts, we thank Missio Aachen, our partners and benefactors, for making this seminar possible. Their generosity inspires us to continue our task of promoting integral human development and caring for the Earth, our common home. May the good Lord bless them and reward them for all that they do. 1.Towards Children At the Sunday school- specific time to be allocated in order to impart knowledge on Christian values and learn the prayers. 2. For Adults During this Year of St. Joseph vaz – Statues to be taken to the houses in every parish- Praying the Novena and litany. 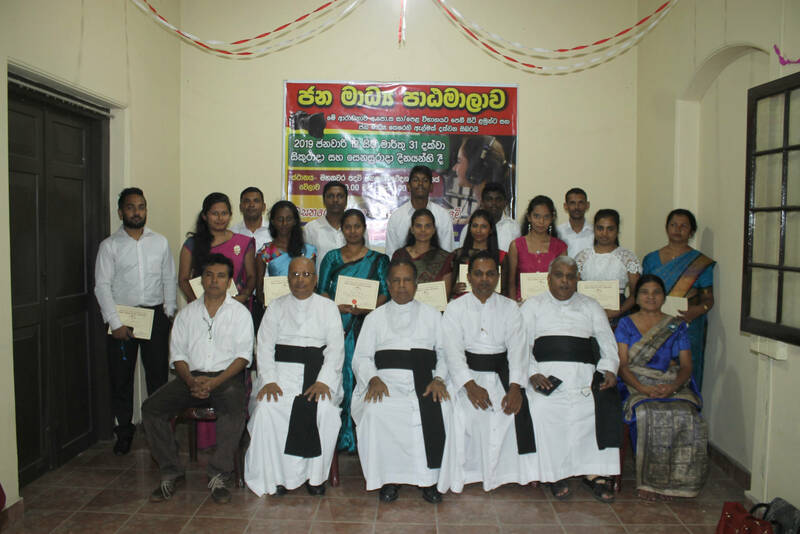 Challenges Lack of involvement of religious in the parish activities. The members of the pious association to visit the families, the sick and the aged. Forming new Lay Leaders / discipleship programmes to be conducted. 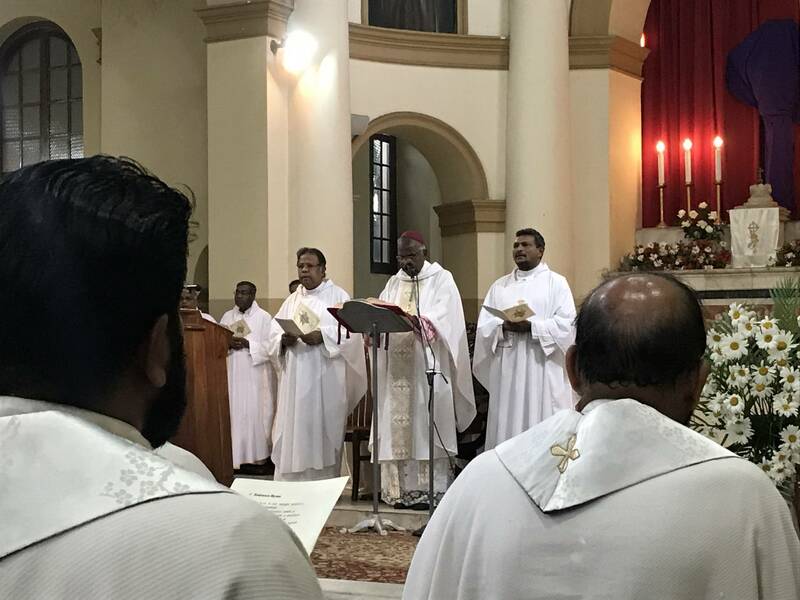 More members to be recruited for the church activities – to recruit new members ( Parish Priests to take interest by extending invitation to the parishioners ). Provide more opportunities for leadership programmes for the laity. Social Awareness programmes to be conducted. Sunday School – To Improve the knowledge of the children with Christian values. At the Sunday school, some time to be allocated to impart knowledge on Christian values and learn the prayers, spend some time in the presence of the Most Blessed Sacrament. . Conduct practical awareness sessions by using modern technology. In Sunday classes, Meetings, Information sharing etc. House visits, Taking statue of St.Joseph Vaz. Conduct special activities where people can come to gather. Sports, Games, Cultural events, Visits etc.